For the first match of the season the Harriers were at Middlesbrough. After watching the Tour de Yorkshire cyclists head past the match got going. 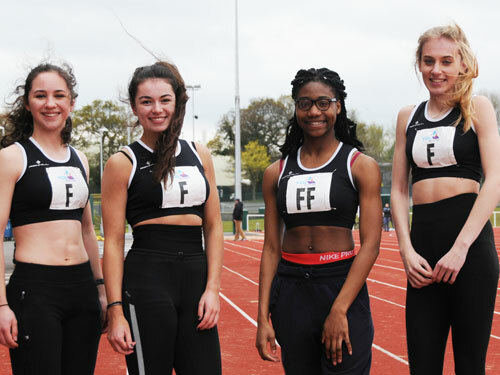 Despite fielding an Under 20 squad team seriously depleted by holidays, Rotherham's Under 17 athletes turned in a number of excellent performances to enable the team to finish in a creditable fourth place. Despite cold and windy conditions a number of athletes set personal best performances. In the Under 20's, Leo Rowley won the shot and set a Discus PB to finish 3rd whilst Holly Rodgers won the hammer and high jump. In the U17's, Ahmed Lahreche won the 200m (in a UKA grade 1 standard time) and came second in the 200m, Declan Walker-Smith and Jack Stokes won the 3000m A & B races respectively whilst Elliott Morley, in his first ever outing for the Harriers, won the 300m Hurdles. For the girls, on the track Ellie Booker won the 200m (also in a Grade 1 standard time) and came second in the 100m, whilst Billie Jo Harris came second in the 100m and 200m running against Under 20 opposition. Continuing the string of wins, Amy Gellion won the 300m (also in a grade 1 time) and Cyane Robinson won the 800m. In the field, Emma Dakin won the Shot Putt and Discus with a second place in the Javelin with Charlotte Kerr second in the high jump (as well as coming second in the 80m Hurdles in a new personal best) and Olivia Parkes second in the Long Jump. To finish off a good day, the U17 girls won both the 4x100 and 4x300 relays, the boys came second in their 4x100 and 4x400 and an U17 squad of girls were came 3rd in the U20 4X100m, only 0.3 seconds behind the winning team. With the athletes who were unavailable this time in the team for the remaining fixtures, the club team should be competitive.